The remaining 27 Nakshatra including Abhijit should be placed in order (clockwise) as shown in the diagram. Any of the tridents: Highly inauspicious. Outside the circle: Average results. Inside the circle: Auspicious results. If the Prashna Chart, Moon Nakshatra is posited in 8th, 15th & 22nd Nakshatra from native’s Janma Nakshatra (No. 1) the answer to query will be negative. If the Prashna Chart Nakshatra of Lagna Lord is posited in 8th, 15th & 22nd Nakshatra from native’s Janma Nakshatra (No. 1) the answer to query will be negative. The result thus obtained will fructify within 72 hours from Prashna time. i tried chandra kala tech for prasna purpose for my prospectus in overall life in general. i asked prasna on nov 11, 2011 , bangalore, 7, 22 pm. 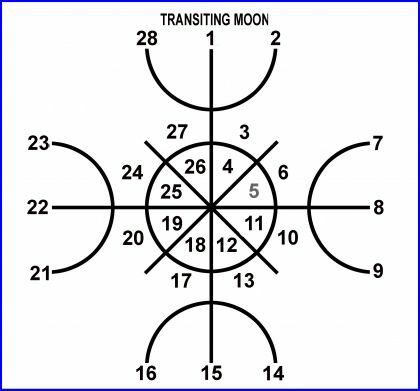 the readings are as follows natal jnma nakshtra aslesha, transit moon krtika so 22nd. transit lagnesh mercury is located in the nakshatras jyeshta from the moon’s nakshatra (janma aslesha),its 10 the from aslesha so average result. also Outside the circle: Average results. Period of validity is Moon’s stay in one Nakshatra. Time of Prashna should be the time when the plane lost contact i.e.the last radio transmission and the position of aircraft should be taken as POB. You can get this from Google maps.This method gives Yes or No answers only. Remember this.